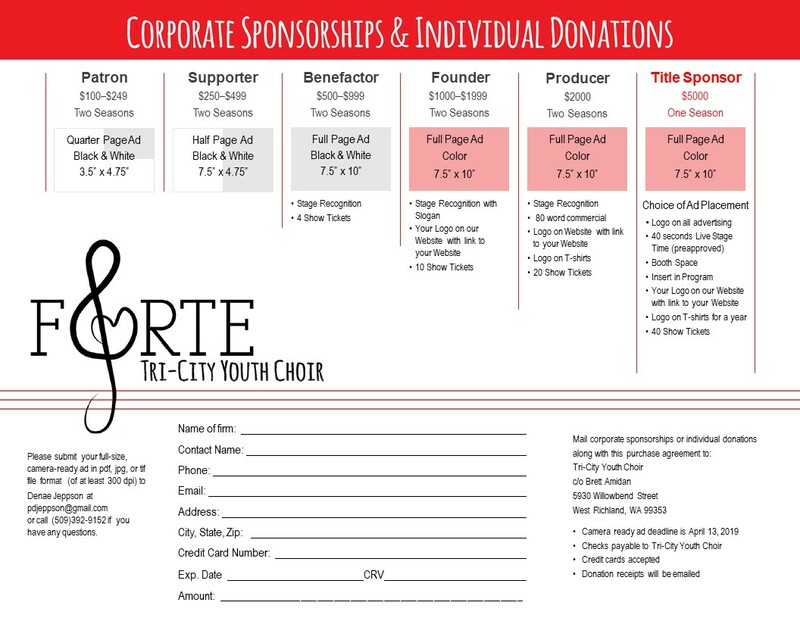 Please make sure that Forte or Treble Forte is a good fit for your family before auditioning by reading the Pre-Audition forms below. Please NOTE: You will need to print the Parent/Student Expectations form, sign it and bring it with you to be eligible to audition. Now that you’ve completed Step 1 and 2 and understand Forte expectations, please review the Audition Details listed below. Complete Step 3 and 4 once you have completed your review. The audition will be made up of three different scores totaling 100 possible points. Demonstrate part learning skills by listening. The auditioner will play a melody on a piano/keyboard in two or three different vocal ranges. The auditionee will sing the melody (on a neutral syllable, like “la”). This step will also help the directors assess the vocal range for the auditionee. Prepare and be ready to sing a Major Scale (on a neutral syllable, like “la”). Rhythm: half-notes, quarter-notes, and eighth-notes. A portion of the melody will include syncopation. Melody: Step-wise and skips no larger than a 4th. Count out loud using the counting syllable system of your choice the rhythm of the sight-reading melody. (example: 1-and 2-and 3-and 4 etc). Preparation- How prepared you are for the audition? Music memorized? Come ready to give us a performance! We want to see your personality shine through your song. Your performance score will make up 30% of your final audition score. If you make a mistake don’t stop, own it and finish your performance! What is the story you are trying to tell with your song? Is it happy, sad, angry, empowering? Make the judges feel something with your performance. Do your body movements enhance or detract from your performance? You can expect to learn a short dance combination with a small group. Then you will “perform” the routine you learned. *We are looking for a willingness and enthusiasm to learn as well as a great attitude even if dancing has not always been your thing. Are you excited to give it a try? Have you found the artistic outlet you’ve been searching for? Please follow Steps 3 and 4 next to complete the audition form and sign up for a time slot. We can’t wait to meet you and see you shine! ﻿What happens after I audition? Results should be published on our website within one week of audition. Upon acceptance into either of the Forte! groups, parents are asked to complete Step 5 below.